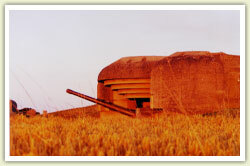 Concrete example of the defence work of the “Atlantic Wall” raised by the Germans during WWII on the western coasts of Europe, this coastal battery is one of the very few the original guns of which were conserved. Located between the American and the Anglo-Canadian sectors, it has 4 guns the fire of which was sufficient to threaten the future Omaha and Gold beaches. The coastal battery was heavily bombed by the allied air force during the weeks preceding the landing ; nevertheless it remained intact on June 6th at dawn : its guns were ready for spitting their shells at the huge allied Armada.